The unknown world of Lahaul and Spiti-Tibetan monasteries, yaks grazing and barren, mountain passes. Plus to add to the adventure both districts are very different. Lahaul has glaciers and Spiti a high desert. A restricted region of Himachal Pradesh has kept both districts intact environmentally and culturally. Trails and lakes are pristine. 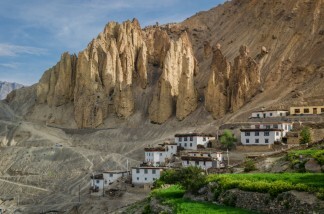 Discover the remote monasteries of Dankhar and Ki on addition to Nako and Tabo. Meet the mountain people who embrace their spirituality, land and their way of life. Magical Lahaul & Spiti is for you travelers who have seen the best of places and deserve to see more! We start our morning tour with New Delhi and visit Birla House, the Former Residence of Mahatma Gandhi before he was assassinated by Nathu Ram Godse on January 30, 1948. Later we visit the famous India Gate followed by the Houses of Parliament, Connaught Place and Humayun’s Tomb*, the first garden-tomb on the Indian subcontinent, built in 1570. We continue to Qutab Minar and its Monuments* Built in the early 13th century the red sandstone tower of Qutb Minar is 72.5 m high. The surrounding archaeological area contains funerary buildings, notably the magnificent Alai-Darwaza Gate, a masterpiece of Indo-Muslim art and two mosques. After breakfast leave hotel for Sarahan en route visit Rampur Palace & Temple. There onwards we continue our journey to Jhakri where we stop for late lunch. After breakfast we check out from our hotel and proceed our journey to Sangla on the main highway (NH22 ) all along with River Satluj up to Karchamm. Near Karchamm we cross the bridge drive and drive uphill onto narrow Baspa Valley. After a journey of 20 Kms up Hill we arrive Sangla (2680 Mtrs). We check in at our hotel. Today we leave for Nako village located in the Kinnaur district. The village lies in the sensitive restricted zone along the border with Tibet. An inner line permit is required to travel through this area. At Nako we enjoy a hot lunch and there onwards visit Nako Lake located (3662 Mtrs) above sea level. The lake is known for its natural beauty surrounded by willow and poplar trees. We also visit the famous Nako monastery founded by Ringchen Zangpo in 996 AD. After visiting the monastery we continue our journey to Gue Village where we see the Mummy of Monk Sangha Tenzin – the only mummy in India to have undergone natural mummification, which was found inside a tomb in Gue village. We later continue our journey to Tabo. On arrival at Tabo, we check in at our hotel. Later, we visit the famous Tabo monastery which is more than 1010 years old and home to many precious Thanka paintings, including the pillar of a thousand Buddhas. The entry to the monastery complex, covering in total 6300 square meters, is made of earthen walls with marvelous colorful frescoes inside. The ancient paintings depict the life cycle of the Buddha, and legends from the Jataka Tales and were made in the Tibetan style by artists from Kashmir.Tabo monastery is listed by UNESCO as a World Heritage Site. It is also called the Ajanta of the Himalayas. Remainder of the day is free to relax. Overnight: Hotel in Tabo (1 Night) (B, L, D). Day 8: Tabo – Lalung – Dhankar – Kaza (3600M) – 117 kms / 6 – 7 hrs approx. After breakfast we check out and leave for Lalung Village. Lalung is home to Lalung Monastry, famous for its beauty and statue of the three cornered Buddha. The statue was made with three sides to symbolize the Buddha looking in all directions at once. We visit Lalung Monastery and there onwards continue our drive to Dhanker Monastery. Early morning after breakfast leave for Ki – Monastery (3926M). Ki Monastery, also known as Kee, Kye or Key Monastery is a Tibetan Buddhist monastery located in the Spiti Valley of Himachal Pradesh. It is close to the Spiti River, positioned between Kaza and a small village called Kibber, in the Lahaul and Spiti district. Early morning we check out from our hotel and drive to Manali with packed lunch. Enroute we visit Kunzum Pass 4551 Mtrs and continue drive along with Chandra River ( Moon River ) up to Grampo and again uphill up to Rohtang Pass 3980 Mtrs. on to Manali. On arrival in Manali, we check in at our hotel. Remainder of the day is free to relax. Overnight: Hotel in Manali (2 Nights) (B, L, D) . After breakfast, we are transferred to international airport in time to connect our flight homebound or onward.